If you thought the days of being "poked" by Facebook friends were over, you thought wrong, because Facebook has decided to bring back the neglected term for its new iPhone app. Earlier this week, we heard that the app was in the works, but we didn't expect it this fast, but word has it that the app was built in just 12 days. The app is called Poke, and is a "disposable chat" app that is looking to take on the reigning leader of that market: Snapchat. 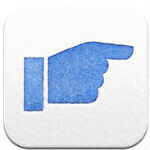 Just like Snapchat, Facebook Poke will allow users to send messages, pictures, or video that will expire 1, 3, 5, or 10 seconds after being opened. Poke will have a "report" feature for unwanted messages as well. And, just like Snapchat, it's assumed that Poke will also end up being used quite a bit for sexting (and has a better name for that activity anyway). Like Snapchat, Poke does try to keep users from being able to take a screenshot by requiring that you keep your finger on the screen while viewing a message, but it is still possible to take a screenshot if you're dexterous enough. Snapchat will alert the person who sent you the message if you try to take a screenshot, and that seems like a much better way to deal with the issue. 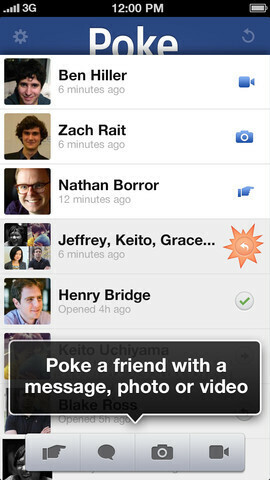 While Poke will only let you send messages with your Facebook friends, your friends will be required to use Poke to see the message. And, right now, the app is iOS only (and only optimized for the iPhone, not iPad). No word on when the app will make it to Android. If you want to give Poke a try, it's available for free in the iTunes App Store. When will it be on droids? Also will it be able to sent to one another droid to iphone/iphone to droid?